Vietnamese authorities are attempting to confirm information reported by international media about China’s deployment of the Dongfang 13-2 oil production and processing platform in the Gulf of Tonkin area located in the East Sea (South China Sea). 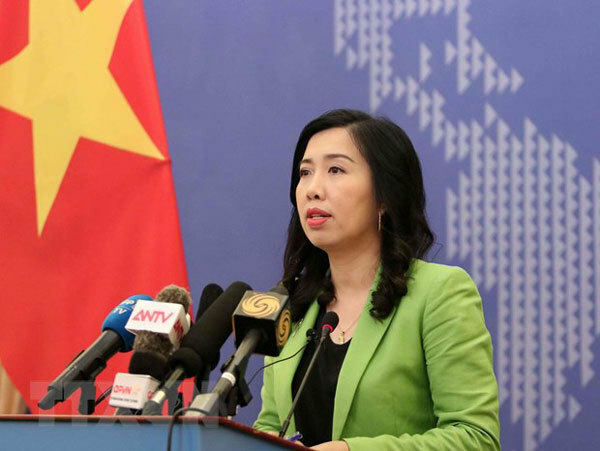 Foreign Affairs Ministry’s spokesperson Le Thi Thu Hang made the statement yesterday in response to media inquiries during the ministry’s briefing. The Agreement on the Delimitation of the Tonkin Gulf clearly defines each country’s territorial sea, exclusive economic zone and continental shelf in the gulf in relevance with international laws including 1982 United Nations Convention on the Law of the Sea, she said. Vietnam and China are responsible for following regulations related to management, exploitation and protection of resources in each country’s exclusive economic zone and continental shelf for national benefits, peace and stability in the East Sea, she said. At the event, reporters also asked about the Amnesty International’s report that was released on Wednesday and mentioned the death penalty in Vietnam. In response, Hang said the application of capital punishment belongs to a nation’s sovereignty over criminal justice and is still present in the legal systems of many countries worldwide. Stopping or eliminating capital punishment is not stipulated in basic international treaties on human rights to which Vietnam is a member. According to the spokesperson, in Vietnam, the sentence and enforcement of capital punishment are applied only to extremely serious crimes in line with the International Covenant on Civil and Political Rights. Judging law violators that can lead up to death penalty is conducted following a strict procedure as regulated by Vietnam’s criminal law. The process ensures the defendant’s rights; respects the presumption of innocence; and ensures the quality of openness, transparency, and fairness. In its legal reform, Vietnam has many times reduced the number of crimes subject to capital punishment. Most recently, the 2015 Penal Code, which took effect in 2018, cleared eight crimes from capital punishment. Regarding Wednesday’s blaze at Central World – Thailand’s biggest shopping complex in Bangkok, Hang said according to the Vietnamese Embassy in Thailand, no Vietnamese citizens have been found to have been affected. Following direction from the ministry, the embassy will maintain contact with relevant Thai agencies to update information and carry out citizen protection measures if needed, she said.